Good morning friends! I hope your fall has been good to you so far. I have been obsessed with making all things pumpkin, have you noticed? I was thinking these sweet mini cakes would be perfect for a Thanksgiving table or for finishing a holiday dinner with friends + family. Can you picture it? 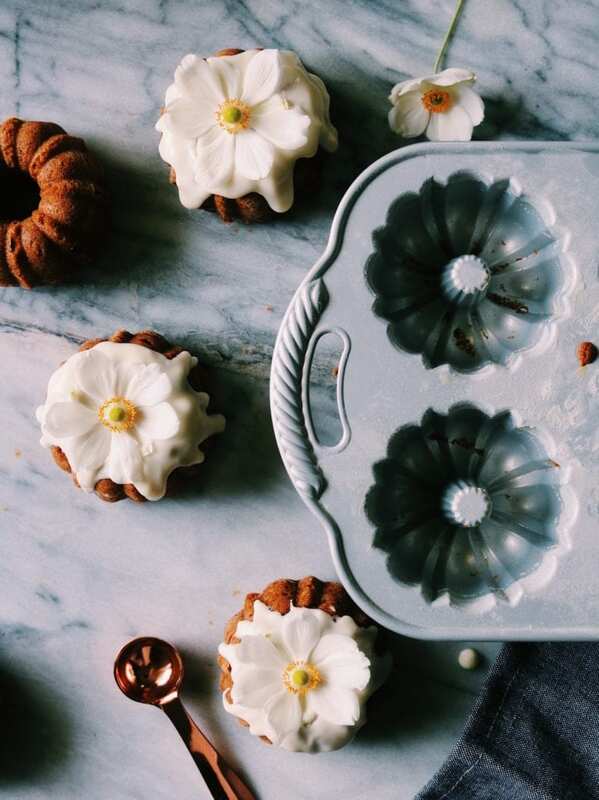 I am super excited about this post as I got to partner with Sur La Table to show you guys some cozy fall baking. To which my mind drifted to pumpkin and maple and bourbon and all things copper. When we were first discussing the details of what would be in this post I said, I think these things would look pretty in some fall baking photos all casual like (because I’m super casual about things) and listed everything you see in the photos here and the sweet Sur La Table woman replied, sounds perfect, they’ll be there in several days! So basically this has been a dream project. And now I have a copper KitchenAid snuggled up next to my silver one on the counter and a kitchen filled with copper mixing bowls, whisks, measuring cups and spoons, earthy linens and beautifully heavy, perfectly heat-distributing bakeware. I’m making pumpkin muffins, pumpkin cookies, apple cider and five-spice cranberry hand pies (recipe coming soon! 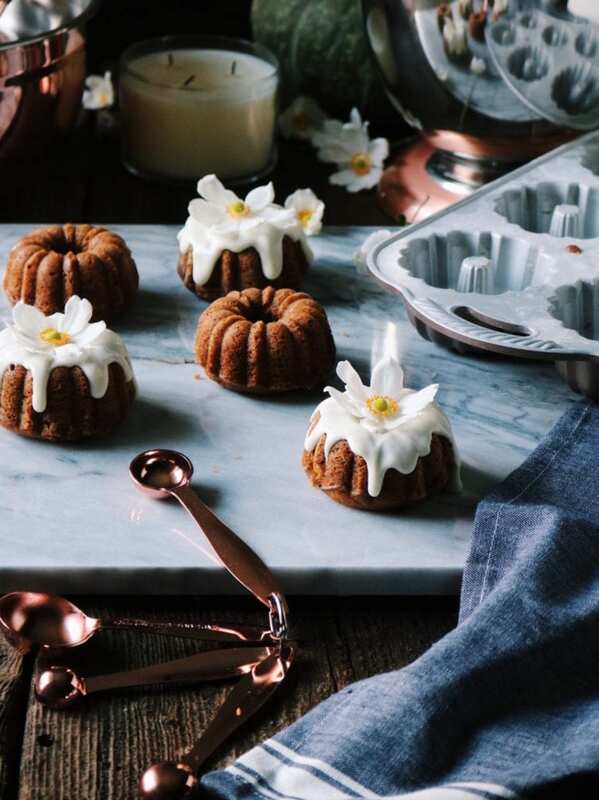 ), these pumpkin bourbon mini cakes (on repeat) and throwing leaves and gourds around the house like a maniac. I am so dog tired as I type this…in spite of my fall euphoria. The house is quiet, everyone is still sleeping and I’m looking forward to a day in slippers, catching up on some baking and recipe testing in my kitchen. It’s a bit disconcerting that I’m this tired this early in holiday season (you know October kicks this off holiday season, right?). It’s like running out of fuel in the first quarter or steam in the first six miles of a marathon. Both are scenarios I know nothing about. But I can imagine. Don’t skip on greasing your cake tin. Either butter + flour or spray with nonstick. Both work great. Get the very best canned pumpkin (I prefer Libby’s) or roast your own. If you choose the latter, smear the roasted pumpkin on a layer of paper towels to release some of the moisture prior to baking with it. The bourbon can be optional. If you don’t want to use it, add in 1 tablespoon of real vanilla extract + 2 tablespoons water in its’ place. Garnish with a fall flower or a sprig of evergreen. I think most things are great the day you make them, but these were also delicious the next day when stored in an airtight container. Let’s bake some mini cakes, shall we? Preheat your oven to 350 F and grease the mini bundt pan. Place the butter, granulated sugar and brown sugar in an electric stand mixer fitted with the paddle attachment and mix on medium until creamy and well blended, about 3-4 minutes. Add in the pumpkin and mix for 1 minute more. With the mixer on low, add the egg. Add the bourbon and water and run the mixer on low for 1 minute more. Bake in the center of the oven for 20-25 minutes. Lightly press the mini cakes to see if they’re done…if they spring back they are done. If it leaves a bit of an indent, they need a bit more time in the oven. Let cool for 30 minutes in the pan and gently turn out onto a cooling rack. If they resists coming out, let cool a bit more in the pan. Cool completely before glazing. 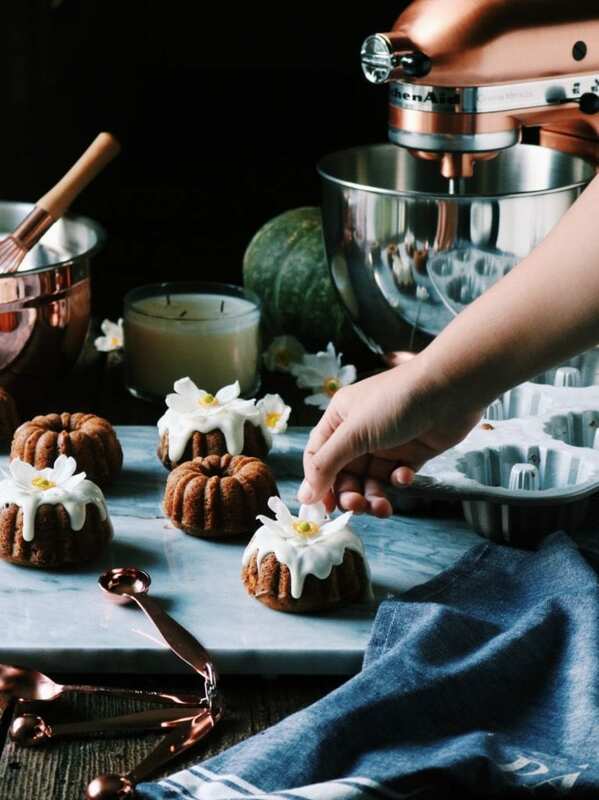 In a small bowl, whisk together the powdered sugar, maple syrup, cinnamon, nutmeg and milk until smooth and drizzle over the tops of the mini cakes. You want the glaze thin enough to drizzle and thick enough that it won’t run off the mini cakes. I garnished with a fall flower from my garden…but I think a sprig of evergreen would also look beautiful! Thank you for making these sweet mini cakes! Tag me @displacedhousewife #displacedhousewife so I can see them!! A huge thank you to Sur La Table for sponsoring this post! All content, ideas and views are my own. Thank you for supporting the brands that keep me in the kitchen! My feature on baking with five-spice powder is on the cover of the current Holiday Bake From Scratch! It comes out this week and I couldn’t be more excited or proud of the recipes in there. I created six holiday recipes all with a little bit of five-spice in them. There is a gorgeous cranberry coffee cake, satsuma marmalade handpies, a persimmon cake that will have you rethinking persimmons, five-spice molasses cookies, cranberry scones and some pink peppercorn madeleines with a blood orange glaze. I’m giving away some copies on Instagram at some point over the next week…so keep your eyes peeled! Wishing you all an awesome rest of the week. I hope it’s filled with laughter and some naps. Lots of love + light! These sweet mini cakes would be perfect for a Thanksgiving table or for finishing a holiday dinner with friends + family. 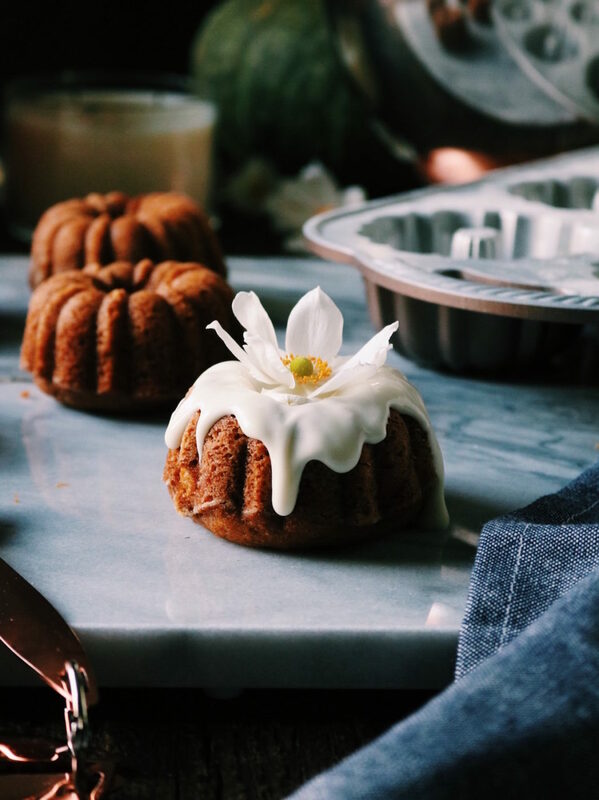 In a small bowl, whisk together the powdered sugar, maple syrup, cinnamon, nutmeg and milk until smooth and drizzle over the tops of the mini cakes. You want the glaze thin enough to drizzle and thick enough that it won’t run off the mini cakes. I garnished with a fall flower from my garden…but I think a sprig of evergreen would also look beautiful! No mini bundt pan (yet) so I tried doubling your fabulous recipe and (score!!) it baked up nicely in a regular bundt pan. I didn’t double the glaze and there was plenty. Delicious!! The aroma in my kitchen was amazing!! Thank you for my new fall favorite cake recipe!! These are so, so pretty! Love the flowers! These are almost too gorgeous to eat! Love the little flowers on top. These look amazing! They are so pretty. I just adore these cakes (mini anything is the best!) and I’m so in love with all the copper! Fabulous post … are the photos your own too? (Sorry, probably missed any thanks you may have given a photographer in my haste to reach the recipe!!) Happy Holidays! Tired already? You got his girl. Loving these little cuties and your feature in Holiday Bake From Scratch! Congrats to you! Love these sweet little cakes Rebecca! (As much as that copper KitchenAid!) It all looks wonderful! Fall/Holiday baking is such fun isn’t it?! Getting these on the baking list soon! Love these! They sound amazing! One small note…bourbon is NEVER optional! Haha jk! I can’t imagine how delicious these are! Oh my – bet you can’t eat just one – or three. So good! No worry about them going stale at my house.